CarGurus has 1,646 nationwide LS 460 listings starting at $5,950. When the Lexus LS 400 debuted in 1989, it sent shivers down the spines of German and American luxury automakers alike. This sedan offered the same level of luxury as their models, but it exceeded them in overall refinement and reliability. The LS 400 would prove to be a giant success in getting this Japanese automaker’s feet off the ground. Since then, the LS has served as the flagship sedan for Lexus and features all the maker’s latest amenities and technologies. Lexus will soon redesign the LS lineup, and as part of that, the LS 600h has been discontinued altogether, and only minor changes are slated for the 2017 LS 460. The LS 460’s shape hasn’t changed much since its 2006 debut, although a major refresh in 2012 brought it more in line with Lexus’ current styling. At its front is a large, trapezoidal grille with chrome slats and surround, along with headlights with LED accents. 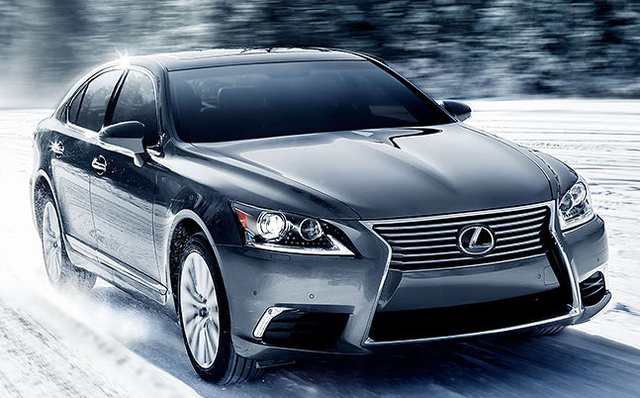 The LS 460’s side profile is accentuated by more chrome trim and a set of 18-inch wheels. An available F Sport package displays aggressive assertiveness with a new mesh grille insert, revised bumpers, and 19-inch wheels. Two new colors are available for 2017: Nightfall Mica and Caviar. Two wheelbases are offered for the LS 460—the standard version rides on a 116.9-inch wheelbase, while the LS 460 L’s is 121.7 inches. The longer wheelbase means a larger back-seat area for passengers, but those sitting in the back of either version will find excellent head- and legroom. If you want to make your back-seat passengers feel extra special, opt for the Ultra Luxury package with 4-zone climate control, power sunshades, rear climate and audio controls, and power-adjustable massaging seats. For the 460 L, the Executive-Class Seating package adds all the features of the Ultra Luxury package plus a power-reclining right-rear seat, a DVD entertainment system, leather trim, and an 110-volt A/C power outlet. The LS 460’s interior pairs acres of leather and soft-touch materials with contrast stitching and wood trim. The driver’s seat gets 16-way power adjustments and memory for driver’s settings for the perfect position, and the passenger seat is 12-way power-adjustable. A 12.3-inch screen provides navigation, audio, climate control, and other key functions through the Lexus Enform infotainment system and is operated via the Remote Touch joystick. The LS 460 also features the Lexus Enform Remote app, which allows compatible smartphones to lock and unlock the vehicle, start the engine, check the vehicle’s status, and locate the vehicle in a crowded parking lot. Power for the LS 460 comes from a 4.6-liter V8 engine paired with an 8-speed automatic transmission and rear-wheel drive (RWD) to produce 386 hp and 367 lb-ft of torque. An all-wheel-drive (AWD) system is available, but lowers engine output to 360 hp and 347 lb-ft. The LS 460 can reach 60 mph in 5.4 seconds with RWD and 5.9 with AWD, and top speed is rated at 130 mph with either drivetrain. Fuel-economy numbers are 16 mpg city, 24 highway, and 19 combined with RWD and 16, 23, and 18 with AWD. An available F Sport package adds performance upgrades like a sport-tuned air suspension, Brembo brakes, a limited-slip rear differential (with RWD only), variable gear-ratio steering, and additional Sport and Comfort driving modes. The LS 460 is equipped with a full set of airbags that includes front knee airbags, antilock brakes, traction and stability control, front and rear parking sensors, a reversing camera, and Lexus Enform Safety Connect. This telematics system can automatically alert emergency services in the event of a crash, locate the vehicle if stolen, and call for roadside assistance. Optional safety equipment includes blind-spot monitoring with rear cross-traffic alert, adaptive cruise control, rear-seat side airbags, a pre-collision safety system, and a driver-attention monitor. The Insurance Institute for Highway Safety (IIHS) gave the 2016 LS lineup a Good rating for moderate front overlap and head restraints and seats, the only categories tested. The 2017 Lexus LS 460 begins at $72,520 for the standard-wheelbase version. If you want the long-wheelbase LS 460 L, be prepared to pony up $78,820. Topping the lineup, the LS 460 F Sport starts at $80,870. What's your take on the 2017 Lexus LS 460? Users ranked 2017 Lexus LS 460 against other cars which they drove/owned. Each ranking was based on 9 categories. Here is the summary of top rankings. Have you driven a 2017 Lexus LS 460?